Description: Exclusively Highlands is holding its largest ever Christmas Fair in the stunning Crathes Castle and the adjacent horse mill. Over 50 makers will be exhibiting arts, crafts and food and once more it will be held over three days – Friday 13, Saturday 14 and Sunday 15. From sculptures, glassware, jewellery, knitwear, harris tweed and preserves, to pottery, hand-reared meats, patisserie and cakes and a host of other goodies will be available. Visitors have the opportunity to chat to exhibitors about their art and the opportunity to purchase unique goods beautifully crafted in Scotland. Refreshments will also be available from the Courtyard Cafe throughout the event. Description: Candybelle’s ultimate christmas fair is back once again and this time we have included loads more designer makers after last year’s successful design room! 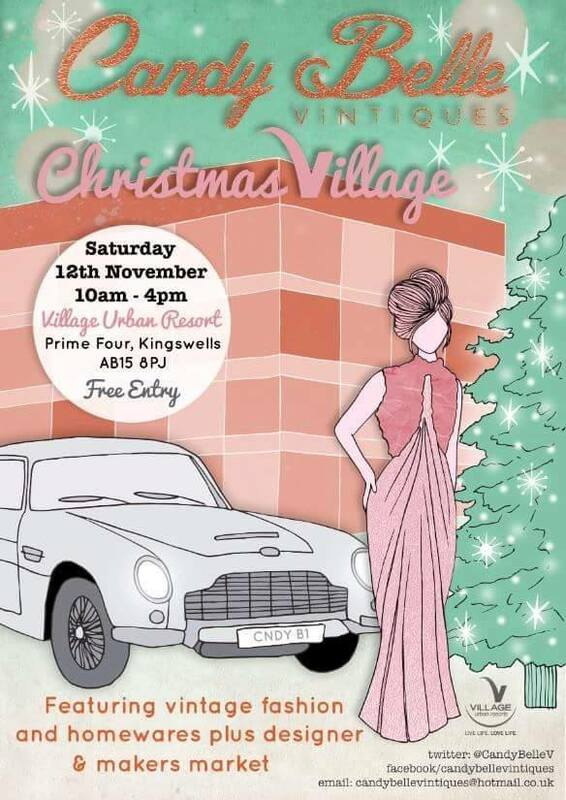 Not forgetting of course pick of the best Vintage traders selling homewares and fashion around these shores. Kick start your christmas shopping and support our handpicked selection of small businesses! Come along and join the magical family fun with Santa and his beautiful Cairngorm Reindeer! Price: There will be a small admission fee on the door (£1.50 for adults and £1 for children) but this will include some yummy refreshments. Description: Oldmachar Community Playgroup will be holding its annual Christmas Fayre on Saturday 12 November. Come and join us for fun for all the family including Santa’s grotto, face painting, glitter tattoos, games, raffle, jam jar tombola as well as a selection of delicious home-bakes and the ever popular chocolate fountain! There’s also the chance to get ahead of the game and start your Christmas shopping early with a selection of homemade gifts as well as a number of external vendors – including Usborne Books, Scentsy, Arbonne, Stella & Dot, Crafty Kerry and Bow Sparkle! Please come and join us for fun for all the family! Description: To celebrate National Pathology Week we’ve teamed up with NHS Grampian to bring you a day of exploration as we explore the world of pathology. Find out how well you wash your hands, discover how X-rays see through our bodies, and explore how bodies fight infection (and sometimes get it wrong!). No Tickets Required although DONATIONS are gratefully accepted. No car parking available on site, Disabled Parking for Blue Badge Holders available at Newmachar Hotel. Pedestrian access only to the event. U64C road will be closed at the A947 Crossroads at Newmachar Hotel to Westgrove House. Diversions via Oldlmedrum Road, Meldrum Drive, Coresduick Road. Description: CLAN Christmas Fayre – Come along and kick off the festive season with home bakes, tea/coffee, shopping stalls and festive games. We look forward to seeing you there! Description: Premnay Hall & Community Association’s Christmas Craft Fair and Coffee Morning. Join us for a selection of local stalls showcasing and selling local crafts and gifts. Perfect for some Christmas Shopping. Teas served in small hall. Raffle on the day. Description: Our fabulous food market returns to the West End on the second Saturday of November. Fish, beef, pork, lamb, game, vegetables, beer, bread, eggs, cakes, home-cooked prepared meals, sauces, preserves, tablet, marshmallows and much more. Description: We are heading back to one of our favourite venues. Meet Olaf and Spongebob, Angus and Donny, Batman and Princess Jasmine will be coming to see hello. Free craft tables Raffles and tombolas Face paints and glitter tattoos Lots of local traders, music and fun. Description: A fun day for all the family, bouncy castle,face paints,tea and coffee PLUS….local crafters selling fab stuff!! Come and start your Christmas shopping and let the kids play. Description: Tarland Playgroup will be hosting their annual Winter Fair on Sunday 13th November in the MacRobert Hall, Tarland. Description: You are invited to our charity Pudsey Pyjama Party! Come along for some Pudsey themed fun and games, all in the name of BBC’s Children in Need charity night! Price: £3 per child, Booking essential: to book a place email alice.walton@gordonhighlanders.com or telephone 01224 498926. Description: In this fun filled workshop, children will paint and mould egg cartons to turn them into poppies and create a wreath made from a paper plate! Description: It’s the November sling meet! Are you thinking about adding a sling into your Christmas wish list? Why not come along to try some out and hire one to make sure it’s the best one for you and your little one? All welcome, whether you’re curious about carrying and want to find out some more information about carrying your baby, infant or toddler or have been carrying for years. Siblings are welcome and, as always, we will have cake!